Gold mining company Shanta Gold (AIM:SHG), will commence production at its Singida Gold Project in Tanzania, in Q1 2017. Singida is an advanced stage gold project, located in the Ikungi Administrative District, Singida Region, central Tanzania, with gold resource of 858,000 ounces (oz). 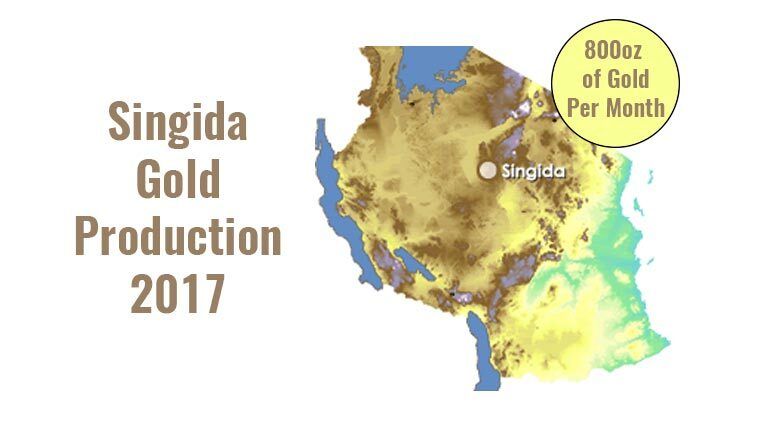 Gold production at Singida is expected to reach approximately 800 oz per month. Development capital of USD4m will be provided from Shanta’s cash flow. Shanta Gold, through its wholly owned companies including Tanzanian subsidiary, Shanta Mining Company Limited (SMCL) is engaged in gold mining, development and exploration in Tanzania. The company estimates Tanzania’s considerable gold resources to be underexplored and underdeveloped. Gold production in Tanzania stands at around 50t per year which makes it the 4th largest gold producer in Africa after South Africa, Ghana and Mali. Gold export accounted for USD1.3b of the total value of Tanzania’s export in 2015, representing more than 90% of the country’s minerals export. Tanzania’s gold export remained steady over the past 5 years with USD1.3b in 2010. Tanzania exports gold mainly to South Africa, India and Switzerland.